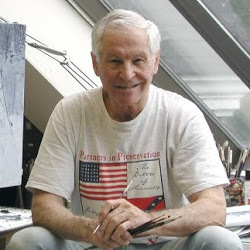 Although Mort Künstler is internationally known for his two-dimensional paintings and prints, in 2003 he received an unusual request from the Middletown Veterans Memorial Committee to design a black granite monument that would stand as the centerpiece of a veteran's memorial in Middletown, Ohio. He came up with the idea of a montage of his works — using existing art and creating nearly a dozen new pieces just for this project. This idea quickly gained the approval and support of the committee raising funds to honor seven Ohio cities and townships. The completed work, which combined laser and computer technology, was unveiled on July 4, 2004. The 8-1/2 foot high wall extends 55 feet long and tells the history of the Armed Forces from the American Revolution to Iraq. The memorial features three Medal of Honor winners and the names of all the men and women from the Middletown area who died in the conflicts. Mort Künstler is seen here with Eric Fogerty and Sam Ashworth, two members of the Middletown Veterans Memorial Committee. They traveled from Ohio to Mr. Künstler’s home in New York to present him with an example of his art etched on granite using the laser technology. Mort Künstler went through a painstaking process to choose images and create a design that incorporated the history of the American Armed Forces. This is the first model of the monument. In order to incorporate the nearly 300 names on the monument and to give greater impact to the viewer, the design was revised. This is the second model of the monument. This is the final model of the monument. Two of the sixteen black granite panels just after being laser etched. The granite panels after initial installation, prior to landscaping and the flags being raised. A - Middletown residents gather before the dedication. B - The walkway leading to the wall is made of bricks inscribed with the names of the veterans. A - The posting of colors was done by the 19th United States Infantry. B - Jamie Osborne sang the National Anthem and Amazing Grace. C - Veterans from each war since World War II spoke at the ceremony. Stephanie Hoffman and Steve Temple, from the most recent conflicts, spoke of their experiences in Iraq. D - Mort Kunstler giving remarks before the dedication. A - Veterans raised the flags and then unveiled the memorial. B - After the ceremony, people went up to get a close look at the memorial. C - A woman points to the name of a loved one on the memorial. Mort Kunstler stands proudly in front of the monument after the dedication.